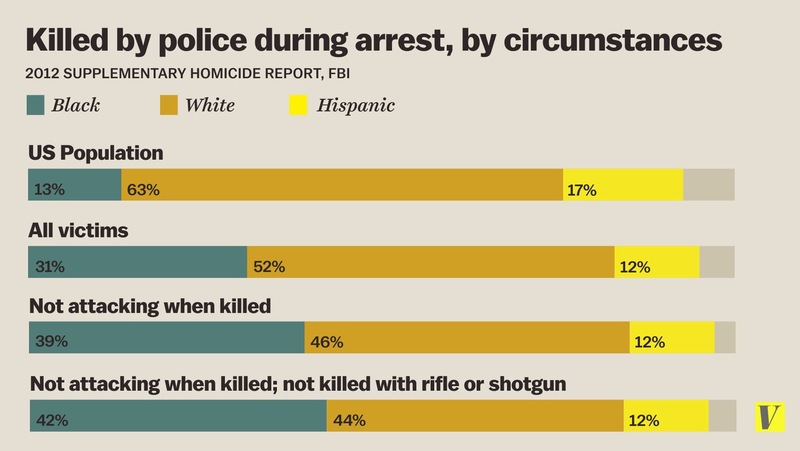 The news website Vox published this chart last year, by Dara Lind, based on FBI data on people killed by police during arrest. The most chilling thing about it is that refined statistical analysis on people killed by police is possible, with all kinds of elaborate subgroup analyses. That’s because there were 426 cases in that year. In general I’m all in favour of more data, which makes it possible to study problems in a more refined way, but I’m happy that the statistics gathered by the Independent Police Complaints Commission don’t have much to work with: In the same year there were 15 deaths in or following police custody in England and Wales. UPDATE: I thought the US number seemed surprisingly small — only about 5 times the UK number on a per capita basis, despite the fact that British police don’t routinely carry firearms. In fact, The Guardian’s documentation of all police killings in the US lists 1146 people killed by police in 2015. I presume this has to do with the fact that the FBI statistic only counts people killed during arrest.